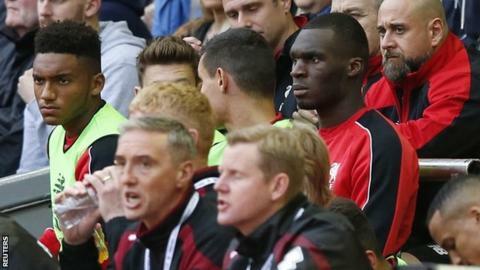 Liverpool striker Christian Benteke will have a scan on the hamstring he injured during the 1-1 draw with Norwich at Anfield on Sunday. The Belgium international, 24, has scored two goals in six Premier League appearances this season and was replaced at half-time by Danny Ings, who scored his first goal for the club. England striker Daniel Sturridge also started after five months out injured. The Reds host Carlisle in the third round of the League Cup on Wednesday. Despite the concern over Benteke - a £32.5m signing from Aston Villa in July - first-team coach Gary McAllister praised 23-year-old Ings for getting off the mark in his fourth appearance. "If anyone deserved a goal, it's Danny Ings," said McAllister of the former Burnley player. "He's worked his socks off every day here. It's not a fluke. He's taken on board the nuggets of information we've given him." Liverpool are 13th in the Premier League table after picking up just two points from their last four games. Captain Jordan Henderson broke a bone in his foot in training on Friday but McAllister said "everything went well" with the England midfielder's operation. The 25-year-old will miss up to eight weeks.